Garth Greenwell joins the show to talk about the poetics of cruising (and cruising’s great leveling potential) in his life and in his debut novel What Belongs to You , the hyper-masculine culture and homophobia of Bulgaria, his concern that contemporary English-language writers don’t read in other languages (or read in translation), his role chairing the 2017 Festival Neue Literatur, the dangers of LGBTQ mainstreaming, the fragility of cosmopolitanism, the state of queer fiction, and our mutual admiration of Samuel R. Delany! Give it a listen! And go buy What Belongs to You: A Novel ! Bonus: This episode is also part of our media partnership with Festival Neue Literatur, which is taking place March 2-5 in New York City! Garth’s the chairperson for the event! Go attend! Maybe I’ll see you there! 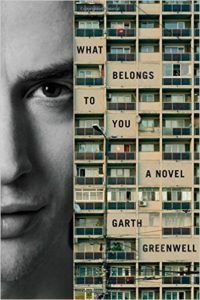 Garth Greenwell is the author of What Belongs to You , which was longlisted for the National Book Award and shortlisted for the Center for Fiction First Novel Prize and the LA Times Book Prize. A New York Times Book Review Editor’s Choice, it was named a Best Book of 2016 by The New York Times, The New Yorker, Publishers Weekly, and over 50 other publications. His work has appeared in The Paris Review, The New Yorker, the London Review of Books, and elsewhere. He lives in Iowa City. Credits: This episode’s music is Nothing’s Gonna Bring Me Down by David Baerwald, used with permission from the artist. The conversation was recorded at the apartment of Jeff Nunokawa on a pair of Blue enCORE 200 Microphones feeding into a Zoom H5 digital recorder. I recorded the intro and outro on a Heil PR-40 Dynamic Studio Recording Microphone feeding into a Cloudlifter CL-1 and a Mackie Onyx Blackjack 2×2 USB Recording Interface . All processing and editing done in Adobe Audition CC . Photo of Mr. Greenwell by me. It’s on my instagram.